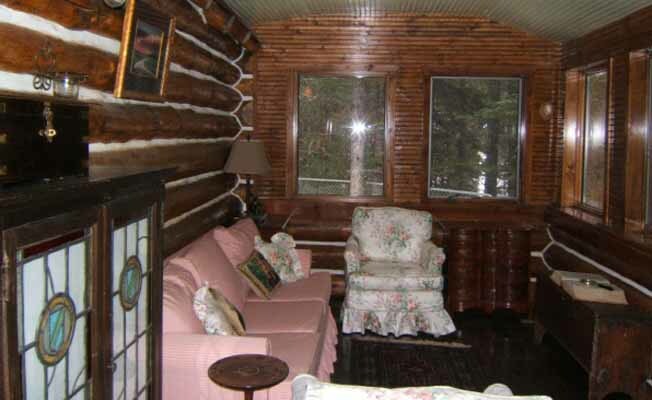 Nestled in the woods in a private setting is an old log cabin tastefully restored, finely furnished and loaded with western charm. The great room has a vaulted ceiling and the log walls are adorned with classic trophy mounts. A stone fireplace completes the setting. The cabin has one bedroom with a queen size bed plus a sleeping loft; cabin sleeps 5. It has a fully stocked kitchen with a microwave oven as well as a barbecue gas grill. There is a six foot tub for luxuriating or a shower for those on the go! Moose, elk, bear, deer and even an occasional buffalo have all been seen on the property. The cabin is only three miles from Yellowstone National Park and within 45 minutes of five blue-ribbon trout waters including Hemingway's favorite, the Clark's Fork. Angling can be enjoyed on the Yellowstone River, Lamar River, the Soda Butte Creek, Slough Creek, Pebble Creek, Hellroaring Creek, Miller Creek and Trout Lake. To the east, the Absaroka Beartooth Mountains provide breathtaking views and numerous trails for hiking or horseback riding. There are several lakes for fishing, kayaking, canoeing, or swimming. Back at the cabin after an invigorating day outdoors, one can relax on the porch and listen to the wind in the trees. Rates start at $200/night, not including taxes.